Gayatri is using Smore newsletters to spread the word online. By Gayatri G., Jessica M., and Alex B.
Shintoism (“the way of the gods”) originated in Japan in about 500 BC. It was used in the 6th century AD, but has roots dating back to the 6th century BC. Shintoism is partly founded on the belief in kami, sacred or divine beings and spiritual essences. Kami are not only found in spiritual beings, but nature as well. Shinto followers believe that they should make peace with other people as well as nature, allowing Shinto to exist harmoniously with other religious traditions. 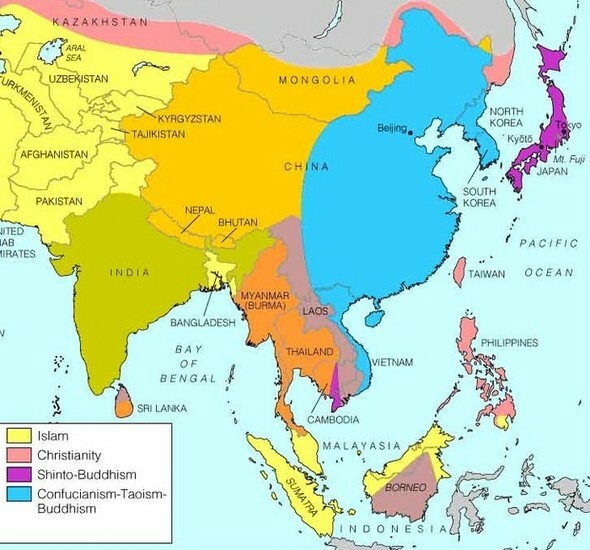 Shintoism is classified as an ethnic religion, forming in and being contained mainly to southeast Asia. It is split into four main branches: Kohitsu Shinto is Shinto of the Imperial House, with rituals that are performed by the Emperor. Minzoku Shinto (Folk Shinto) has no formal central organization, and therefore is not specifically classified as a branch of Shintoism. It is mainly practiced by small groups or villages that worship their local deity. The largest branch is Jinja (shrine) Shinto, in which the shrines themselves are supposedly representative of manifestation of faith in kami. The newest form is Kyoha or Shuha Shinto. It is made up of 13 sects that worship a central deity. The 13 sects are Kurozumikyo, Shuseiha Shinto, Izumooyashirokyo, Fusokyo, Jikkokyo, Shinshukyo, Taiseikyoshinto, Ontokekyo, Shintotaikyo, Misogikyo, Shinrikyo, Konkokyo, and Tenrikyo, although Tenrikyo withdrew from the Federation of Sect Shinto in the 1970s. Diffusion-It did not diffuse. Shintoism started in Japan in ancient times when citizens (ancient shintoists) discovered the forces of nature and their divinity. The practices, beliefs, and traditions were passed down only through word of mouth from each generation to the next for 5 centuries. After chinese writing was facilitated, then religous writings and artifacts about traditions and ancestors were also passed down the generations. Shintoism as a whole has selectively remained in Japan since. However, because of relocation diffusion from Japan to Cambodia and Laos, there has been a mix of shinto practices and ideas into the majorly buddhist two countries. Holy Places- Shinto shrines are regarded as the home of the kami. The most important shrine building is the inner sanctuary (honden), in which a sacred symbol called shintai ("kami body") or mitama-shiro ("divine spirit's symbol") is enshrined. The usual symbol is a mirror, but sometimes it is a wooden image, a sword, or some other object. In any case, it is carefully wrapped and placed in a container. It is forbidden to see it: only the chief priest is allowed to enter inside the inner sanctuary. A toril gateway is located at the entrance of the shrine and is a holy symbol. Shintoism does not have a specific holy place, since its philosophy is harmonizing humanity and nature into a peaceful society. Therefore, nature is the holy place. Where it is practiced today-Apart from very small religious groups located in different countries, Shintoism is mainly practiced only in Japan. Key People- People who practiced shintoism worshiped their emperors because they thought that they were related to the sun goddess. 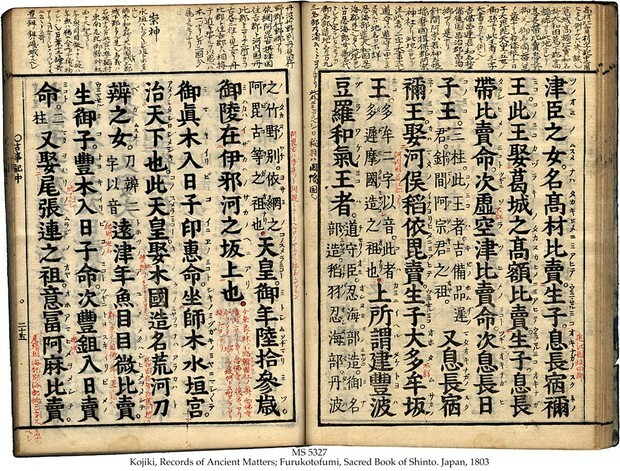 Holy Texts- Some of the “holy texts” are the “Kojiki” or the “Records of Ancient Matters”, and “Nihon-gi” or “Chronicles of Japan”. Religious Symbols- There are many religious symbols, Maneke Neko is a good luck cat found in many homes. Places of Worship- As mentioned before shintoists worship at shrines of kami. Impact on social and family structures- Since shintoists want to become “Kami” they run a more strict lifestyle so their life ambition (becoming kami) will happen after they die.